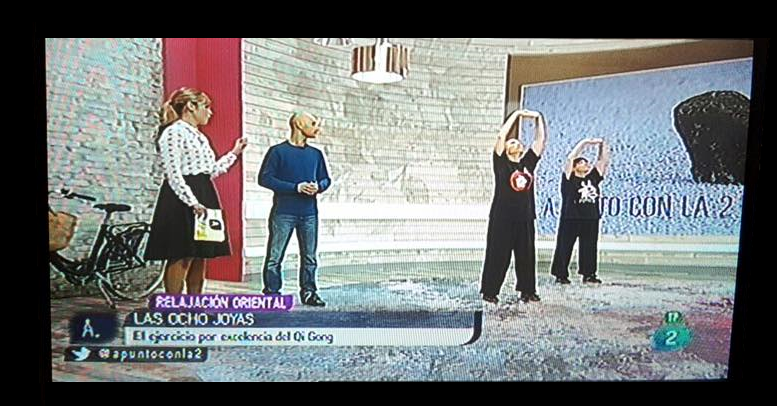 In the section “Oriental relaxation” part of the de RTVE “A point with La 2” again they counted with the participation of Maria Isabel Garcia School Health JingShen, Idaira school Moya Canary Qigong and Ivan Trujillo School of Internal Alchemy. On this occasion they attended the program to explain the benefits of exercise “Holding Heaven”, It is belonging to the system Qigong “The 8 Jewelry”, and to explain how to perform this exercise correctly. The interview was conducted by a presenter of the program, Elisabet Carnicé.